Barcode Mark Package 6.0.1.5 - Download Win Apps. Barcode mark package application makes professional barcode sticker in own style. Barcode image building tool is used in different business organizations like retail sector, telecom, transportation, warehousing, manufacturing, banking etc. 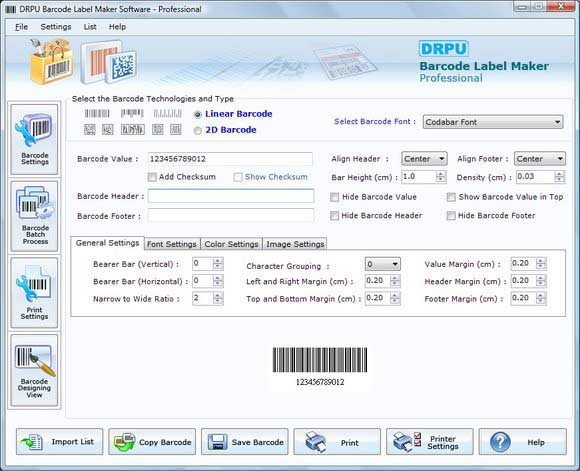 Barcode mark package application offers various barcode methods such as random, constant value and sequential series for producing bulk barcode images in minimum time. Barcode label creator program permits user to easily modify size and shape of barcode ticket using flexible barcode setting. Barcodesoft Code 39 Premium Package empowers you to print Code39 barcodes from desktop printers. It is able to encode 43 characters. There are 14 fonts, a crystal reports UFL DLL, a sample and a GUI encoder included in the package. Barcodesoft Code 93 Premium Package empowers you to print code93 barcodes from your desktop printers. It is able to encode alpha-numeric data. There are 14 fonts, a crystal reports UFL DLL and a GUI encoder contained in the package. Barcodesoft Code 128 Premium Package empowers you to print Code 128 barcodes from desktop printers. It is able to encode ASCII data. There are 28 fonts, a crystal reports UFL DLL, a sample and a GUI encoder included in the package.